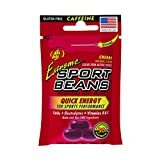 Extreme Sports Jelly Beans are caffeinated jelly beans made by Jelly Belly. Each little 1 ounce bag of jelly beans packs 50mg of caffeine (according to Jelly Belly). 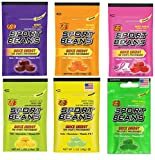 Jelly Beans have long been used by endurance athletes as a source of sugar - and the "sports" formula has electrolytes in it is well. 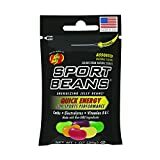 These cherry-flavored jelly beans contain a "formula of carbohydrates, vitamins and electrolytes". These jelly beans are not suitable for children.